The collaboration will primarily focus on increasing public disease awareness and providing more accessible healthcare services via digital platforms in China. 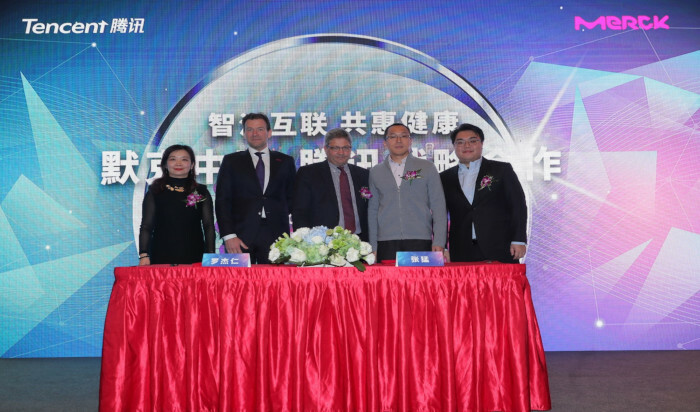 Yesterday, Merck, a German multinational pharmaceutical, chemical and life sciences company, and Tencent, a Chinese multinational investment holding conglomerate, signed a strategic collaboration agreement. The collaboration will primarily focus on increasing public disease awareness and providing more accessible healthcare services via digital platforms in China. With the agreement, Merck and Tencent will create intelligent digital healthcare services, thereby increasing public knowledge of diseases and improving patients’ understanding of disease symptoms and effective treatment options. The collaboration will also provide patients with more convenient and smarter medical services, helping to better manage chronic diseases. The focus areas will include all treatment areas of Merck’s Healthcare business in China: in allergies, Merck and Tencent will explore digital services that increase the awareness of allergy symptoms and encourage adherence to treatment plans; in the area of infertility, the collaboration will work to enhance awareness of disease and treatment options and help patients who are in need of fertility resources to shorten the process of medical treatment. The two companies will also focus on diabetes, thyroid disorders and cardiovascular diseases, as well as oncology such as metastatic colorectal cancer (mCRC). In the future, Merck and Tencent will continue to extend the scope of collaboration to other areas such as exploring the use of innovative medical service models based on “A.I. doctors” to provide more comprehensive disease awareness education and treatment services for mCRC and other diseases. WebMD, an American online publisher of news and information pertaining to human health, well-being and drugs, teamed up with Tencent in July 2018 to introduce the health information platform to Asia. This means that WebMD’s services will be translated into Chinese and localised to suit the Chinese population. Through Tencent’s digital platform, users in China will also gain access to WebMD’s WeChat and QQ Browser.